October 24, 2013, 10:41 a.m.
A rift opened in the Coalition last week as Liberal Democrat leader Nick Clegg opposed the Conservatives&apos; stance on Free Schools - schools outside of local authority control, set up by parents and other groups. He called for more safeguards to “guarantee minimum standards”, arguing that Free Schools should be forced to employ fully qualified teachers and teach the national curriculum, which they currently are not required to. Clegg’s comments were dismissed by Conservative education minister Elizabeth Truss, who said these freedoms were the “whole point” of free schools. New YouGov research for the Times finds that public support for Free Schools has dropped, and Clegg’s recommendations are widely supported. Just 27% now support the creation of Free Schools, down from 36% in September. Opposition is up from 40% to 47%. 66% think that schools should only be able to employ people with formal teaching qualifications, whilst 21% feel that teachers without formal qualifications should be able to teach if they have relevant experience. Despite the disagreement between the Conservatives and Liberal Democrats, their voters agree that only those with formal teaching qualifications should be employed. 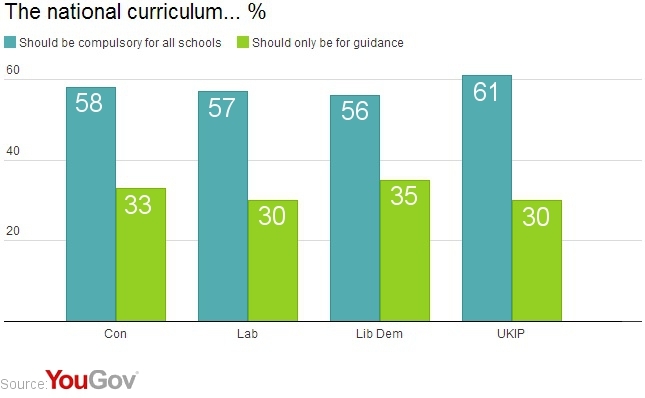 56% feel that the national curriculum should be compulsory for all schools, while 31% feel it should only be for guidance. Again support is consistent for supporters of all the main parties, with UKIP the most strongly in favour. A damning Ofsted report for the Muslim Al-Madinah Free School in Derby has helped fuel debate on free schools. The report found the school "dysfunctional", saying its teachers were inexperienced and had not been provided with proper training. David Cameron acknowledged that action needed to be taken, but said "Let&apos;s not use this as a stick with which to beat the whole free school movement - there are now hundreds of schools which have set up as free schools, and on average they have more outstanding and good ratings than established schools."